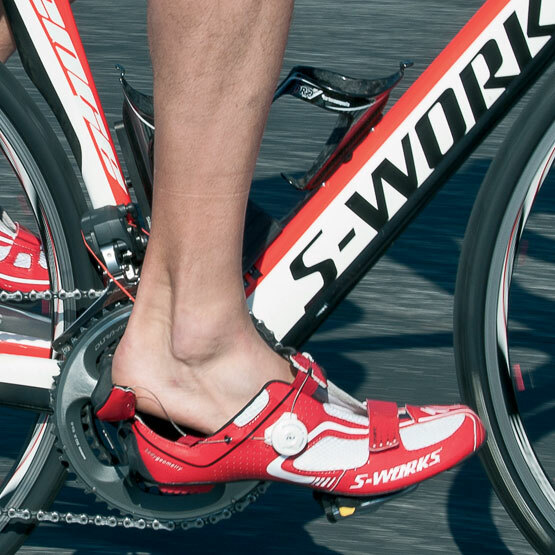 When you think triathlon specific shoes, one of two images will come to mind—a large, single Velcro enclosure or the rear closure system of the Specialized S-Works Trivents. If you’re not familiar with it, believe us when we tell you that the Specialized S-Works Trivent closure system completely revolutionizes T1 and T2. The closure system is just that unique. In an effort to back up this claim, we knew we’d need to spend some significant time with the shoes. So began our two-month journey with the Trivents. Our primary goal was to determine if the Drawbridge closure system was everything we hoped for. We also wanted to find out if the closure system compromised the shoes ability to transfer power to the pedal, which after all is the only point of shoes in the first place. It was obvious the minute we opened the box that these shoes were truly something special. The Drawbridge closure stands out immediately. The intention of the Drawbridge is to turn your standard cycling shoe into more of a cycling “slipper”—allowing you to slide your foot smoothly into the shoe without any of the grabbing, pulling, and tugging you’ll experience with most traditional shoes on the market. While this would benefit any athlete, the biggest benefactors are those attempting a flying start. Rather than riding with your feet on top of the shoes at first, the Drawbridge closure allows you to slide your feet right in and start pedaling immediately. The most noticeable aspect of the Drawbridge closure system is the hinged heel. When opened, this feature provides easy access to the shoe. When closed, it fully secures your foot inside. To make this work, Specialized utilized the BOA closure system. For those unfamiliar with it, BOA utilizes a steel cable running throughout the shoe to tighten and loosen, which is accomplished via one or more rotary dials. To tighten, you simply turn the dial. Loosening is accomplished by popping the dial outwards. With most cycling shoes, BOA is used to bring the two sides of the shoe together. But this wasn’t going to work for the Trivents. Instead, a single BOA dial is used to both close the heel and tighten the shoe’s upper. The result is a shoe that can slide on like a slipper and tighten to the perfect fit with just a few turns of a dial. Specialized put a great deal of thought into many of the small details other manufacturers frequently over look. For example, to hold the heel open, Specialized included a magnet in the heel loop that folds down and sticks to the base of the heel. This allows the shoe to stay open until the BOA dial is engaged. To aid with flying mounts, the Trivent includes a small clip on the inside of each shoe that can be used to secure a rubber band for holding the shoe in place. Like most triathlon-specific shoes, the Trivent is designed for sockless wearing and includes a smooth internal lining. To help deal with wet feet following the swim, there is an open tongue for increased breathability and a large drainage hole near the front of the shoe (we’ve already seen this work extremely well during a very rainy test ride). The heel lugs are replaceable, which is a huge benefit for those who are not inclined to do flying mounts (no one wants to throw away a pair of shoes just because the heel lugs are worn out). While you’d probably expect our first impressions to focus on the Drawbridge, we actually noticed the stiffness of the shoe most of all. The Trivent’s sole is made from high modulus, unidirectional carbon and the result is one of the stiffest shoes we’ve ever worn. Throughout our testing of the Trivents we’ve come back from each ride wondering how we’d ridden for so long with other shoes that had even a hint of flex. There is little doubt that with each rotation of the pedals every watt you are putting down is being transferred via the Trivents. As for the Drawbridge, we have been highly impressed. 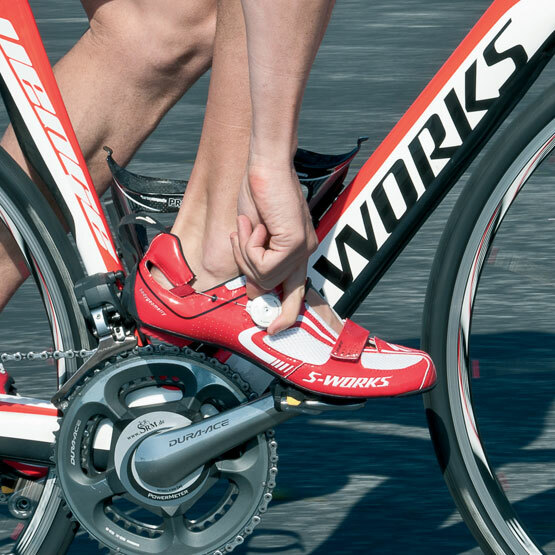 While our test rides to date have focused more on riding with the shoes than transition training, we can appreciate just how easy it is to slip these shoes on and off with every wear. You simply slide your feet in and turn a dial. No fussing with Velcro straps to get the fit just right. The BOA system also lets you tighten in very small increments so you can spin the dial until the fit is right for you. The only downsides we have come across in the first few weeks of testing are regarding the shoe’s price and color. 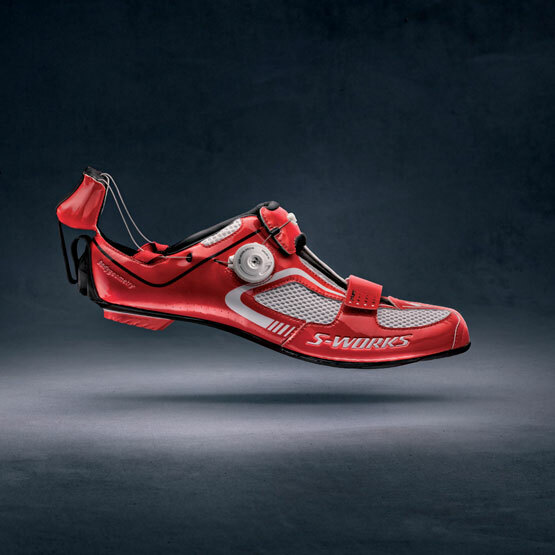 The S-Works Trivents are going to set you back $400, which we recognize is no small amount to pay for shoes (though comparable with other shoes of this quality). However, if you’re looking for a shoe that will get you out of T1 faster while ensuring maximum power transfer, you may more easily justify the price. Although when it comes to color, we really wish Specialized offered a few more options. The Trivents are only available in the red\white color scheme. We realize that some athletes may not care about color, and for those the red\white is just fine. But for others (like Mike) who want their shoes, kit, and frame to match perfectly, a black option would have been a welcome addition. Also we have to mention that the white parts of the shoe tend to show dirt extremely quickly. We are only a few weeks in to an almost two-month test plan, so we have quite a bit more time with the shoes. Obviously one of the big areas of testing will be executing some flying mounts to experience just how easy the BOA system is to use in racing scenarios. We also want to take the shoes climbing and sprinting to see how the closure system works when you are mashing and ripping on the pedals. As always, feel free to comment here, on Facebook, and on Twitter if you would like to see anything specific in our Final Thoughts article roughly a month from now. 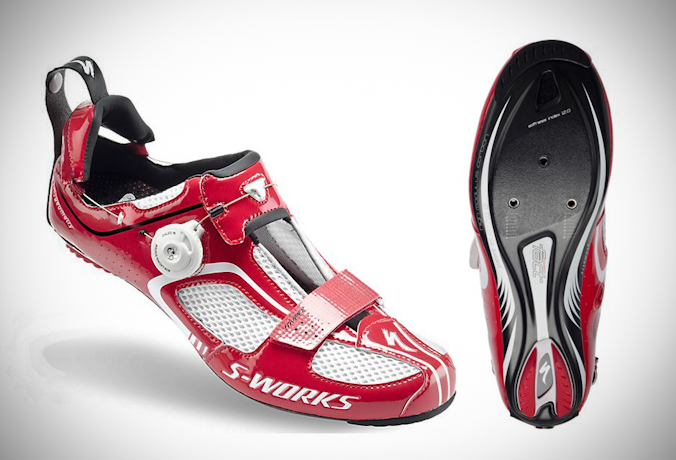 I am in the market for new triathlon shoes, and seriously considering buying the specialized sw trivent! So thank you for a well written article. Did you have a chance to test a climb with the shoes? This is the only point were i am a little “nervous” for the flipback heal setup. We haven’t yet but it is on the test plan. Similar to how we tested the Osymetrics, we want to see how the Trivents do with both climbing and sprinting. If you can wait another month we will be sure to include it in our final thoughts, but if not lets us know and we can provide some input back here. I have the Trivents and haven’t noticed any issues on climbing. Did a HIM with 4000ft of climbing and were fine. They are definitely not as snug as the road shoe but still snug enough. I did rip the heel strap that needed repair. Seen it happen a couple of times to people but not over frequent. On this model my back rubber strap broke the first time I used them . how can I replace or fix this ? Hi Jessica – we do not believe it is replaceable. You will have to reach out to Specialized specifically to see what they can do.